WASHINGTON — As a young girl growing up in suburban Chicago, Hillary Rodham decided she’d never change her last name. Three decades later, an entire state debated her childhood choice. Bill Clinton lost that race. But it was his wife who ended up making the most lasting recalibration. Today, they hear from Hillary Clinton. That’s the name aides to the front-runner for the Democratic presidential nomination say she now prefers. You might not know that from looking at her campaign website, on which she’s simply referred to as Hillary. She was Hillary Rodham Clinton throughout her time as first lady and secretary of state. That was also the name she used as an author of two best-selling memoirs and how she signed legal documents – “H R Clinton” – as recently as this past summer. Citing Clinton’s preference, The Associated Press this past week changed its style and refers to her as Hillary Clinton. Several other news organizations have done the same. The shifting monikers fit into an attack line Republicans have pushed for years – that Clinton is an unprincipled creature of Washington whose positions move with the political winds. Longtime Clinton observers have a slightly different take. They say the changes reflect necessary political calculations in a country that remains conservative about family names, even as family structures have become less traditional. Roughly 8 percent of married women in the U.S. use their maiden names alone, while 17 percent use their maiden names in connection with their husband’s last name, said Pennsylvania State University sociologist Laurie Scheuble, who’s studied the choice of last names by married women and based her research on census data. That was certainly the opinion of Arkansas voters all those decades ago. Statewide polls later found that her use of her maiden name had cost Bill Clinton as much as 6 percentage points in that unsuccessful race for governor. Longtime friend Ann Henry urged Clinton to make the change after the loss. “I’m sure it was a hard choice for her to make, because she had been steeped in what women could do up East and she’d given that up to come down here,” Henry said. Bill Clinton later said he tried to talk his wife out of changing her name, saying he did not want her to resent the choice – and him – for the rest of her life. But she countered that it wasn’t worth it to keep both names. Nearly a decade later, when she arrived in Washington after Bill Clinton’s election as president and took on a role at the White House focused on health care policy, the then-first lady began using the name Hillary Rodham Clinton. Polling at the time showed that 9 percent of Americans thought the change was a good idea, 21 percent a bad idea – and 69 percent said it didn’t much matter. 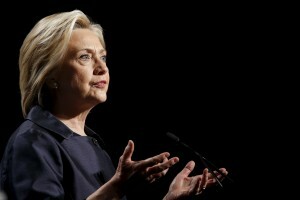 She ran for the Senate in New York as “Hillary,” then went back to Hillary Clinton for her 2008 presidential campaign. She returned to using Hillary Rodham Clinton as secretary of state, and did so until the launch of her second White House bid this year. Former aides and supporters predict that, unlike in Bill Clinton’s race in 1980, the choice won’t matter much at all when voters start casting ballots next year.